There are many reasons for regain after WLS and we cover most of them from time to time. Here’s an interesting feature from a Life Coach who has high-lighted the top 3 most common reasons for weight regain – by examining these you may be able to make plans to avoid the pitfalls. What others concern you? Making the decision to have weight loss surgery is a very big deal. It seems obvious to say that when someone agrees to weight-loss surgery they’re desperate for help to change the way they’re living, or not fully living their lives. Everyone goes into the procedure ready and willing to surgically alter their anatomy hoping for a better future. So why is it that so many will fall short of losing the optimal amount of weight for their health and will actually regain within 3 years much if not all of the weight they lost? Some studies say 1/3 of patients will regain most of their weight post-surgery. I think the number is actually higher because many people who regain simply fall out of contact with their bariatric surgeon and support staff because they feel ashamed, so the statistics do not include these people. 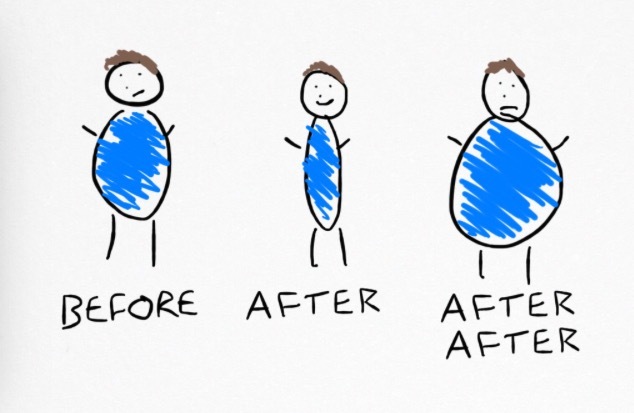 So, why do most people regain the weight? What can you do to help insure that you will be one of the successful long-term losers of your excess weight? By examining why people fail you can create a plan for how you will succeed. The government agency, National Institutes for Health (NIH) defines weight-loss surgery as “merely a tool that helps people get a new start toward maintaining long-term good health. The surgery alone will not help someone lose weight and keep it off. Together with a reduced-calorie and low-fat diet and daily exercise, surgery will help an individual lose weight and maintain the weight loss.” Please read that a few times. That is how important this quote is! The surgery alone will not help someone lose weight and keep it off. We as weight-loss surgery patients have a history of seeking comfort, happiness and pleasure through food. We wouldn’t be here if that weren’t true. Me included. The process of surgically altering our anatomies does nothing to remove from us the tendency to seek comfort in familiar ways but assures there will be physical suffering if we do. Post-surgery we will still have the same brain that is used to comforting us with food, and we will still have the fingers and the arms that are used to lifting food to the same mouth to find comfort and pleasure. It is critically important that the WLS patient seek out new ways to soothe, comfort, and find pleasure in their world other than by eating. ONE main reason patients regain their weight is they search for ways to get around the surgery, still thinking of food as primarily a source of pleasure, not a source of fuel that can be pleasurable. This is often done relying on liquid calories, which may pass more easily, like high calorie coffee or juice bar drinks or alcohol. This is also done post-operatively by trying to maintain the presence of “trigger foods” in their lives. “Trigger foods” are often foods from the patient’s past that helped cause obesity, do not satisfy hunger but instead create a craving. Many are high-calorie and highly processed, not nutritious. Trigger foods can include chocolate, chips, crackers, bread, cookies, ice cream, pudding, lattes, frapuccinos and alcoholic beverages. Really, any food can be a “trigger food” if there is so much pleasure in the “mouth-feel” or taste that repeating the pleasurable experience takes on more importance than actually feeding hunger. Very successful patients cultivate a mostly trigger-free post- surgical life. Bariatric surgeons know the most common reason for regain. The most common post- surgical complication is “noncompliance.” Non-compliance is a fancy word that means the patient is not eating and exercising the way he/she agreed to before surgery. These people “talk the talk.” The successful patient “walks the walk” after surgery and changes how they eat and move. A SECOND reason people often regain beginning in the second or third year post-op is that the “honeymoon” is over. The “honeymoon” generally encompasses the first 12 to 18 months post- surgery. During this time many patients will say, “I could eat all the chocolate and ice cream I wanted and still lose weight. I didn’t have to try and the weight just came off.” This is often true because the body has been through such a shock after surgery that it takes months for the body to reset itself and learn to function with its’ new physiology. Patients who regain their weight often believe that this “honeymoon period” is the new way that it will always be and don’t adopt healthy eating patterns. So when their “honeymoon period” ends as it will they believe that the surgery has somehow failed them. In reality they have failed their surgery! During the first 12-18 months post-op it is essential to develop healthy patterns around food and exercise. This is the time when it is actually easiest to do and to not do so wastes a once-in-a-lifetime opportunity to begin a great new life with positive momentum. A THIRD reason many patients regain much of their lost weight is a lack of support. Humans are social animals and we desire and need the support of each other throughout our lives. For thousands, if not tens of thousands, of years people coming together as a family or a community over food has been a way we connect with each other. Post-surgery, when the patient isn’t able to eat what others are eating or in the quantities others are eating, or others are eating their ‘trigger foods”, life can feel very stressful and lonely. This can be compounded by being around unsupportive people or people who want to be supportive but don’t know how. Patients fail by not surrounding themselves with supportive people in a safe environment where they also must be accountable for their actions and behavior with food and their bodies. It is key to have a community of professionals and non-professionals who understand the challenges and hardships faced by those carving a new life with a new anatomical structure. There are online and in-person support groups. Even patients who’ve gone abroad for weight loss surgery can often use the support services available with their local medical group’s Bariatric department. Creating relationships that support and assist you in becoming a healthier person and that hold you accountable for making healthy choices are key. These are my top three. What would you add to this list? What plan will you create to deal with the items you add to this list? Who will support you on this journey of your life…..for your life? I too have to admit to being concerned about weight regain. I am only 4 month out and although have not really had bad habits creep back in, am very wary of them doing so. I do exercise a great deal more though so I suppose that would help to counteract the weight gain but you are right, it is about the foods we must NOT eat creeping back in. I on the whole am good but have to admit to having eaten crisps, chocolate and taken on alcohol. These are only in small amounts and hopefully will remain so as I tell myself that each day I must not fall back into old ways. It really is a worry for sure, especially when in the public eye as we both are! !